These complete range of Georgian hanging baskets, wall baskets, wall troughs, patio cradles, flower fountains, jardinières are heavy gauge and steel strip throughout. 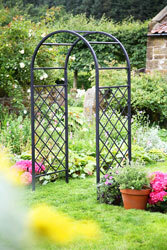 This hanging gardening and patio range has a durable black wrought iron crackle finish. 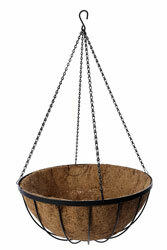 The hanging baskets come with galvanised 4-point linkages on larger baskets. All this Georgian basket range come complete with quality co-co liner is included. These hanging basket liners are pre shaped for convenience, just drop in. These coco liners are made to fit the Georgian hanging baskets. 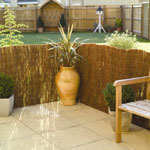 This coconut liner is long lasting natural coco fibres with latex coating. These hanging basket liners are pre shaped for convenience, just drop in. These planter liners are made to fit the Georgian hanging baskets. 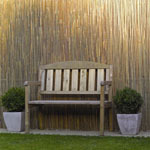 This coconut liner is long lasting natural coco fibres with latex coating. 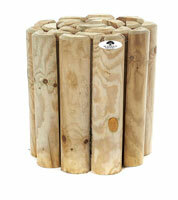 These wall manger liners are pre shaped for convenience, just drop in. These coco liners are made to fit the Georgian basket liners. 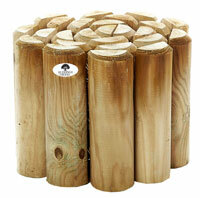 This coconut liner is long lasting natural coco fibres with latex coating. These wall trough liners are pre shaped for convenience, just drop in. These coco liners are made to fit the Georgian trough liners. 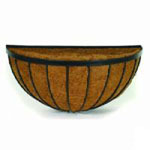 This coconut liner is long lasting natural coco fibres with latex coating. These cradle planter basket liners are pre shaped for convenience, just drop in. These coco liners are made to fit the Georgian cradle planter liners. 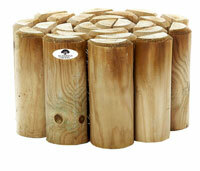 This coconut liner is long lasting natural coco fibres with latex coating. 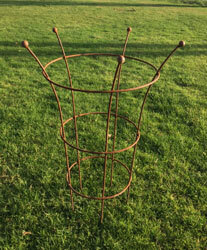 Size: 30cm and 35cm baskets x 88cm Tall. Size: 30cm, 35cm and 40cm baskets x 100cm Tall. Complete with four 30cm (12") metal hanging baskets with liners. Traditional styled cradle planter new design for this season. Made from steel rod and flat bar with crackle black coating. Comes complete with coco liner. Size: 40cm high x 60cm wide x 30cm deep. We have a large range of window boxes to fit under most sizes of window.